I can’t bring myself to call this a recipe, but BLTs and corn make for a tasty, easy weeknight dinner. Preheat oven to 400°F. Cover a baking pan with parchment paper. Place bacon evenly on baking pan, and cook 15 to 20 minutes until crisp. While the bacon cooks, toast the bread, and slice the lettuce & tomato. Blot bacon with paper towels, and assemble sandwiches. Note: While the ingredients list is specific, any bacon, lettuce, & tomatoes will work. 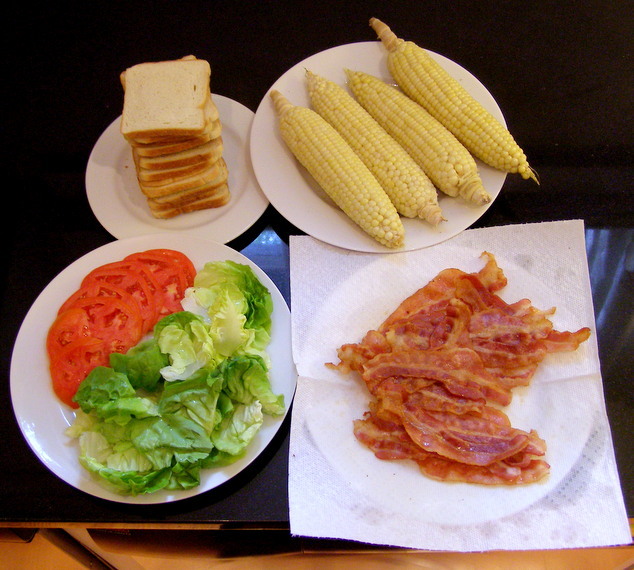 Farmer’s market tomatoes & center cut bacon tend to be more flavorful, and I like the texture of Bibb lettuce. The bread, however, I feel pretty firmly about, unless you have an excellent French baguette. Specifically, I like the thinness & crispness of the toasted bread, which lets the other flavors shine through. Smoked Salmon BLTs | BLTs with slow-roasted tomatoes | BLTs with avocado & poached eggs (or fried eggs). Preheat oven to 350°F. Evenly space corn on middle oven rack. Roast for 40 minutes; remove from oven with tongs. Let cool at least 10 minutes before removing husk and silk. The husks keep the corn warm, so leave them on until ready to eat. Once husked, add butter, salt, and/or pepper to corn as desired. This is one of our standbys. It takes less than 15 minutes to make, keeps well in the fridge, and has a satisfying blend of protein, carbs, and a little veg. 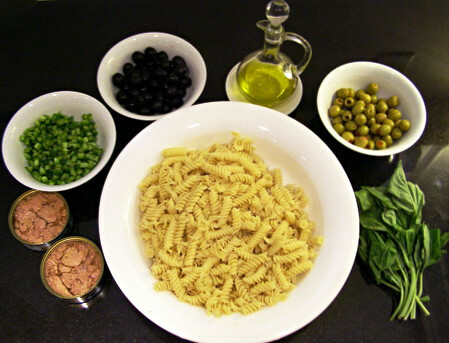 Cook pasta according to box instructions & drain. Add to large serving bowl. Drizzle lightly with olive oil & toss. 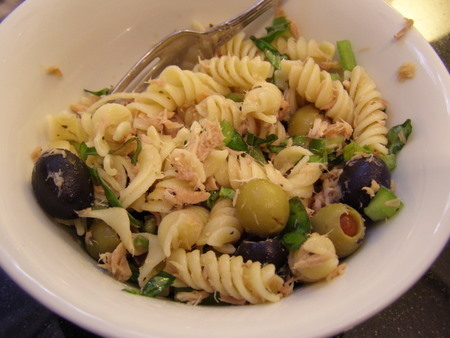 Add the tuna, green pepper, basil, and both kinds of olives to pasta bowl. Season with salt and pepper, then toss and mix well. Serve. Cheeky Kitchen has a great lemonade slushy recipe. You can substitute Splenda for some of the sugar for an even healthier drink. While my dream of a true margarita popsicle has died (apparently alcohol doesn’t freeze well), I still have these Campari citrus pops from The Kitchn. 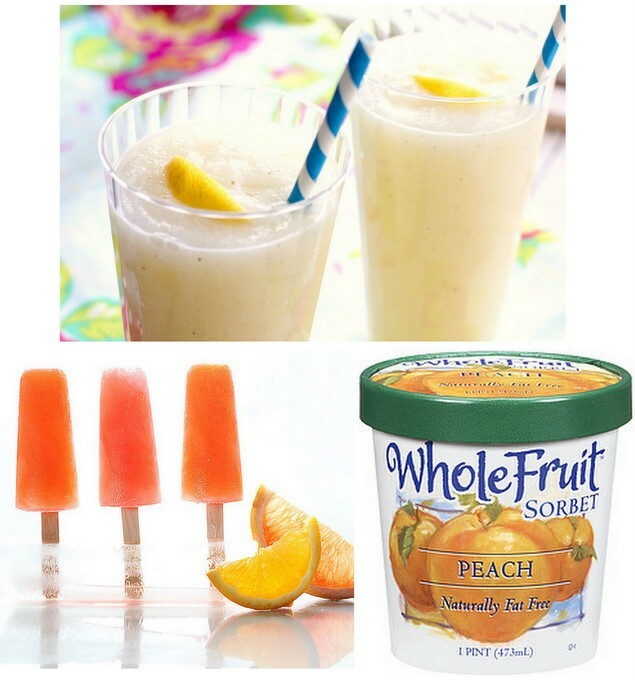 We’ve tried several flavors in this line, but the Whole Fruit Peach Sorbet is the best. Living Social has another 2 tickets for $9 deal up, so click on over. I actually squealed when I saw the deal on a friend's Facebook post; summer's my main movie-going season, and sweet mother is it expensive. The fine print says it doesn't apply to IMAX or 3-D movies, but I used the last coupon for the 3-D IMAX version of Thor (blergh), so…maybe? The croissants are probably my favorite find; I've heard them compared favorably to Williams-Sonoma's frozen croissants, which are about 3 times more expensive. I recommend all of these! Top row: Gideon Defoe's The Pirates!, Nick Hornby's Housekeeping Vs. The Dirt, Georgette Heyer's The Unfinished Clue, Winifred Watson's Miss Pettigrew Lives For a Day. Bottom row: Dorothy L. Sayers' Strong Poison, Guy Delisle's Burma Chronicles, Barbara Pym's A Glass of Blessings, Elizabeth Von Arnim's The Enchanted April. They recently closed the biggest Borders in the Atlanta area. Towards the end, as the sales got better and better, my mom and I went every Friday to leisurely pick over the store's carcass, making intense decisions over whether or not to buy X book now, or risk losing it by waiting for a deeper discount. The above pile cost $39.32, with individual discounts of 60% to 70% off. I bought a comparable stack every week, even though I couldn't afford it and certainly don't need more books. I now understand the manic helplessness of gamblers and other compulsives. It is not pretty. Have a great weekend (and drop me a line if you have any book or Trader Joe's recommendations)! Last week, I made a modified version of this Real Simple recipe. I chose it because it hit my weeknight recipe trifecta: fast, easy, and cheap. It’s also delicious; the lemon adds just enough interest to a classic dish. Preheat oven to 450°F. 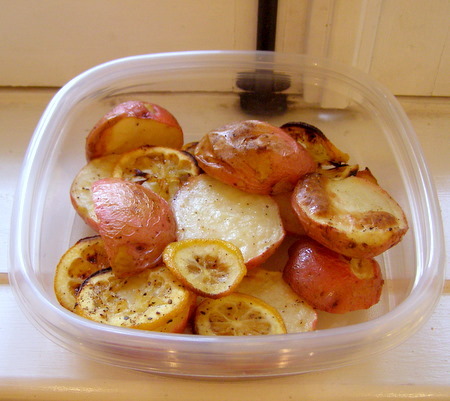 Place potatoes & lemon on rimmed baking sheet, drizzle with the oil, and add salt & pepper. Toss to coat evenly. Cook on middle rack for 30 to 35 minutes (stirring potatoes midway through) until potatoes start to brown. Serve.